"The entirety of Golden’s historic downtown rests along the Kicking Horse River adjacent to the most vulnerable section of dike. The area houses Golden’s only two chartered financial institutions, law and insurance offices, post office, and important infrastructure private and public systems including water, sewer, gas and electricity- all of which rest below the level of the dike. Almost 20% of Golden’s entire Commercial Assessment value (approximately $24 million) is threatened by a dike breach in this area. Moreover a flood event into the downtown would sever traffic flows on Highway 95, and thereby cut off all emergency services to the area, given that all services are located on the opposite side of the river. A flood event could also affect the National CPR Mainline. A dike breach adjacent to Golden’s downtown would spell economic and social disaster for the community, while posing serious health and safety risks, crippling the community’s operating systems, and cost many millions of dollars to address." 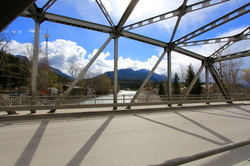 - Kicking Horse River Dike Upgrade Project (Bridge 2 Bridge), Town of Golden, attached below. 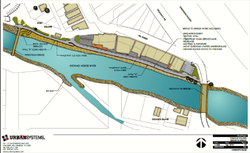 While public funding for this project was defeated in fall 2012, it would have lended to improving pedestrian flow on the river side of 9th Avenue North and resulted in businesses improving the appearances and access to the current backs of the buildings. Also, this project would have connected the downtown shopping area with Spirit Square and facilitated the burying of the many hydro/utility lines that clutter that alleys between 8th and 9th Avenues and detract from Spirit Square. 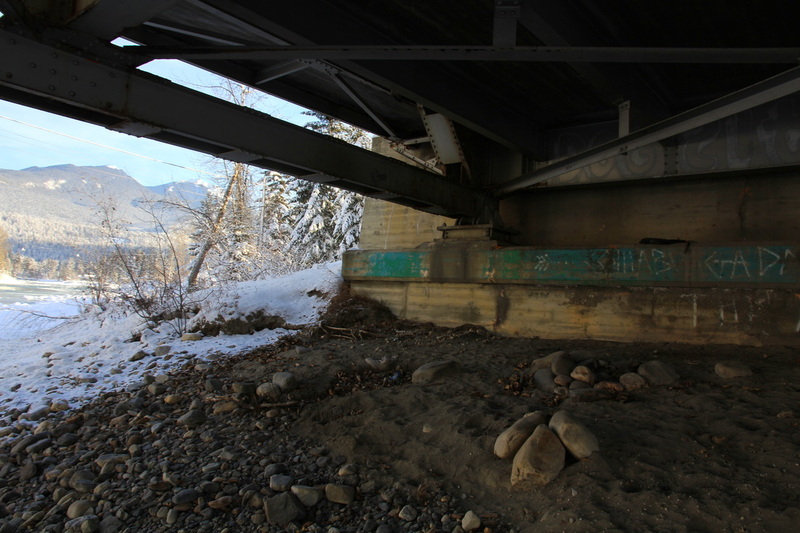 The only two bridges which span the Kicking Horse River and accommodate automobile traffic were built in 1952. Community projects in and around Golden's riverfront have been delayed as the community waits to hear when the Province will need to replace it or if they will instead invest in the Highway #95 Bypass Project. 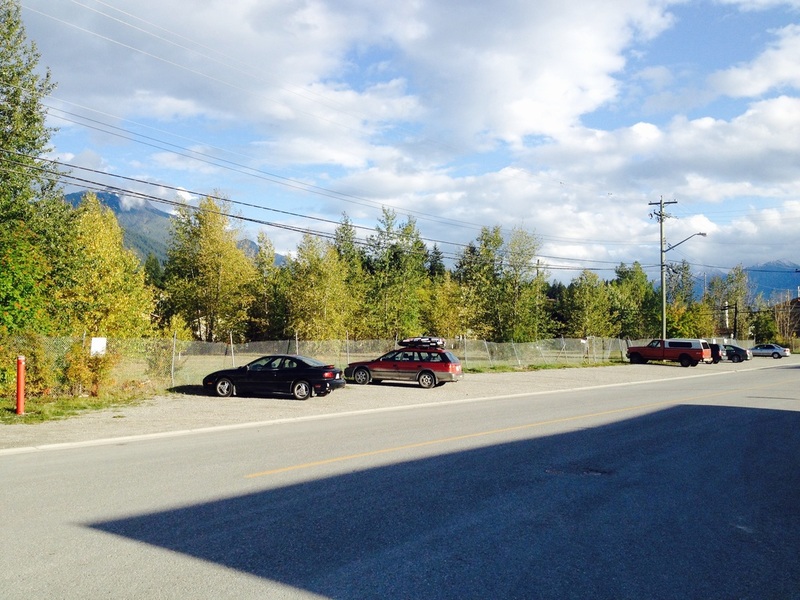 It is expected that if the bridge is replaced, the CPR parking lot and leased Kicking Horse Chamber of Commerce will be displaced as 10th Avenue/Highway #95 is realigned along the railway tracks and run right in front of Kicking Horse Movies on the south side. It is possible that the bridge will become 4 lanes. Some of the anti-B2B arguments centered on the idea of waiting until this vehicle bridge was updated/replaced. 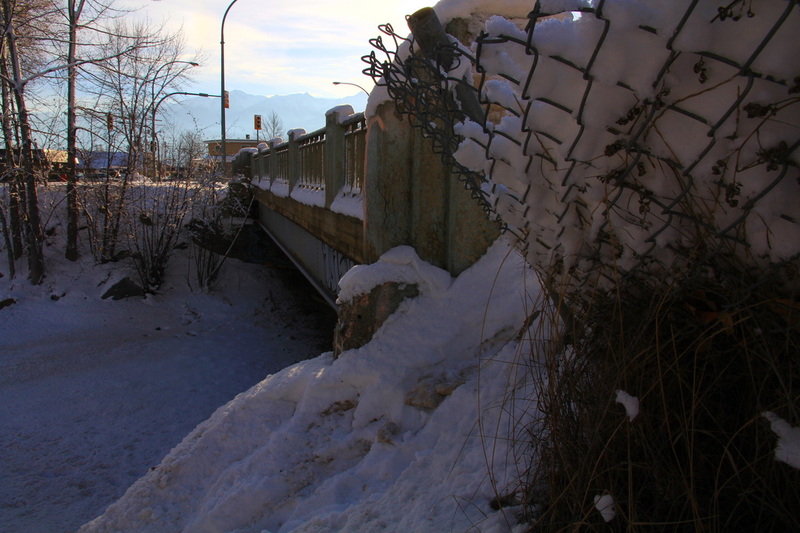 While a replacement of this bridge by the Provincial Government may help to improve safety and access, putting other needs on hold and waiting for it as a possibility is causing the community to stall and languish. 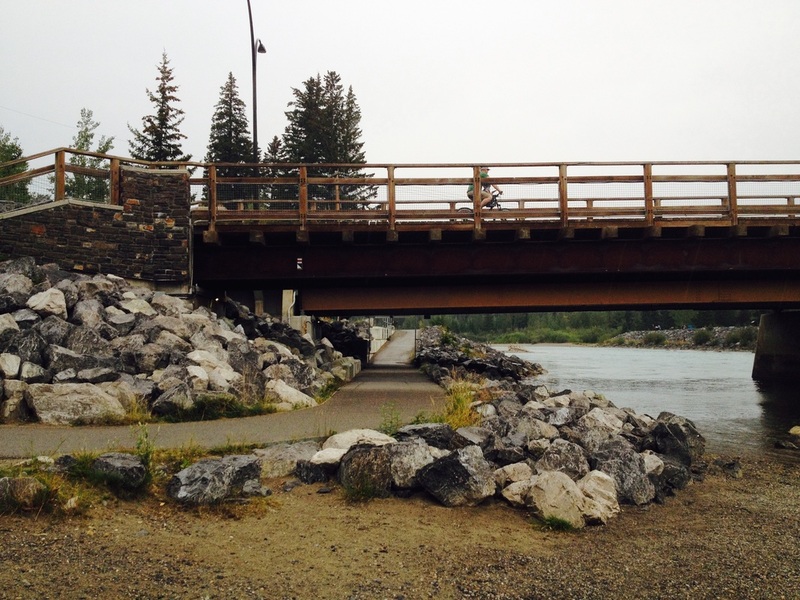 Share your placemaking ideas for Golden's Kicking Horse River bridge replacement at the October 5, 2016 MoTI meeting, 4-8pm, at the Civic Centre, and through the online survey. Now is your chance to raise the concepts of road re-alignment; a pedestrian & cycling underpass; Kumsheen Park improvements; public art; etc. that will shape our community for the next 70 years. And if you can't make the meeting, send your ideas to Tim.Dyer@gov.bc.ca; call 250 354-6187. With 10th Ave bisecting the Kicking Horse River trail, the single crosswalk just south of the river is quite busy. The curves in the road, t-intersection and right-hand turn ramp make is quite complex - some would argue unsafe. One way of improving both vehicle traffic flow and pedestrian/cyclist flow at this point would be to install an active transportation underpass. This underpass would involve moving the channel dyke rocks so that they form a relatively flat ramp down to the riverbed on both sides of the southerly bridge. 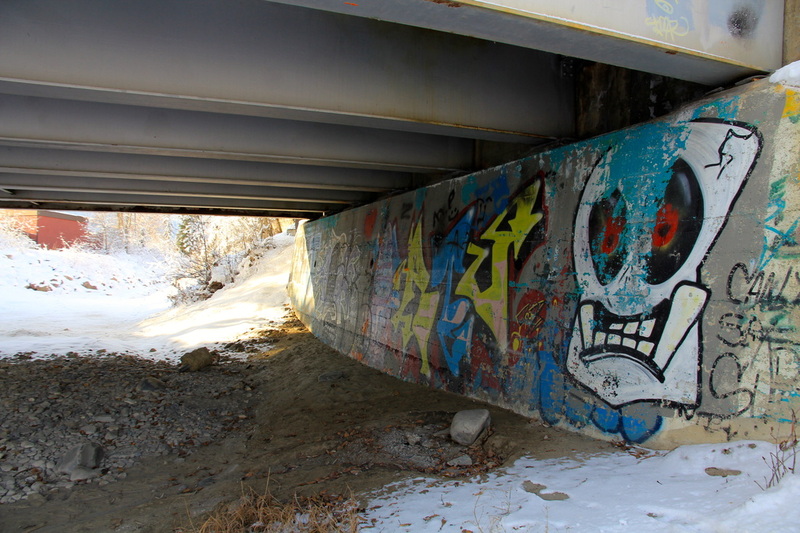 For approximately 11 months of the year, this channel is dry and would provide unencumbered access for pedestrians to get passed 10th Ave.
Canmore, AB has a very sophisticated underpass trail network. Golden's underpass could be built by simply moving some large rocks so that a flat side faces up and filling in the gaps with smaller rocks and gravel fill. The field near the Old Mill, adjacent to the Columbia River, is used as Golden's unofficial dog park. However, it is far away from the homes of many Golden residents and results in many unnecessary automobile trips. It also lacks a fence. The Imperial Oil/Esso fuel depot east of the Royal Canadian Legion and Overwaitea is thought to be another potential dog park site. This brownfield is in the centre of town, creates multiple dead end streets, has some mature trees and a derelict steel fence. A much bigger brownfield re-utilization project, Refinery Park is currently underway in Calgary. 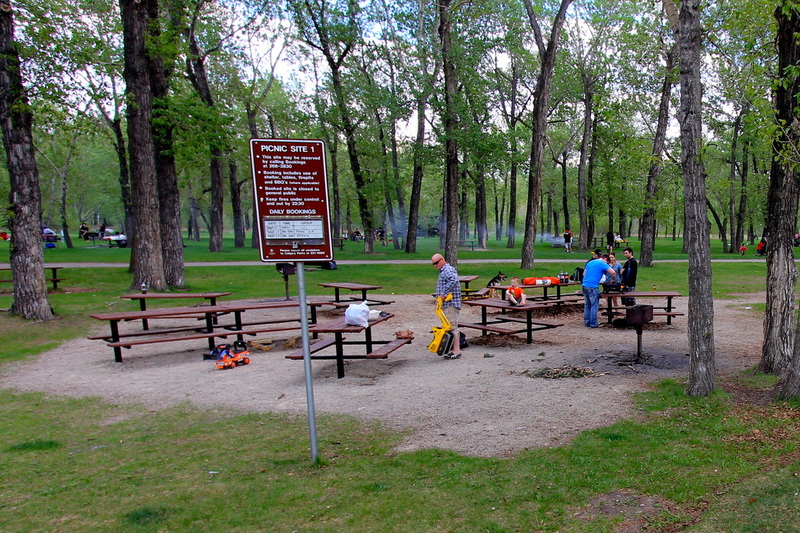 Negotiation with Imperial Oil/Esso may result in a long-term lease to the local government and service clubs working together may be able to create a green space in the heart of Golden. 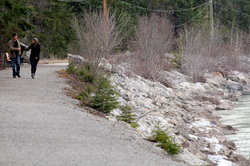 Positioned in the destination centre of the Golden community, the proposed Resort Municipality Infrastructure (RMI) funded Amenity Hub project has been led by a team comprised of Jon Wilsgard, Chris Cochran, Gary Smith, Mike Pecora, Bill Usher & Len Brown and is in-line with the Town's Resort Development Strategy. The team taken 9 months to consider and plan for the "technical, environmental and socio-psychological factors" of the project (Town of Golden, 2013). 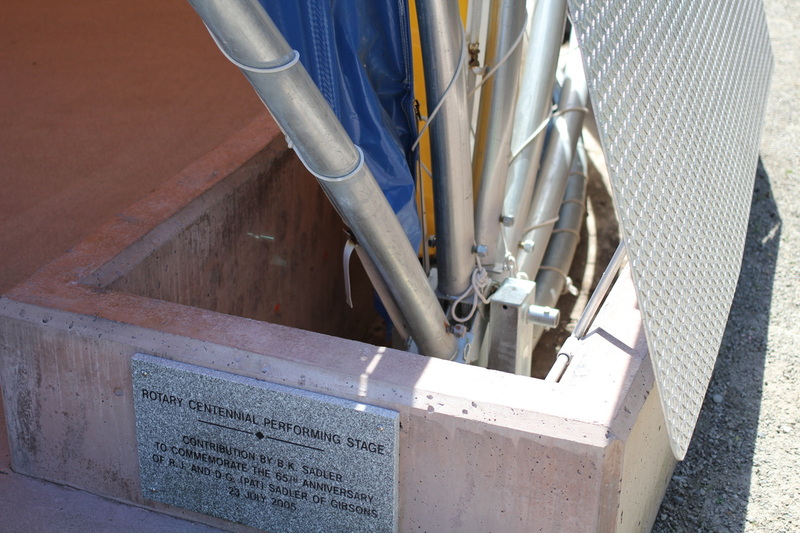 With an expected completion date of December 2016, this project may start in 2014, resulting in the replacement of the temporary washrooms already in the Square, new seating area, storage facility, visitor information, a possible food concession and the creation of a permanent stage for public events. 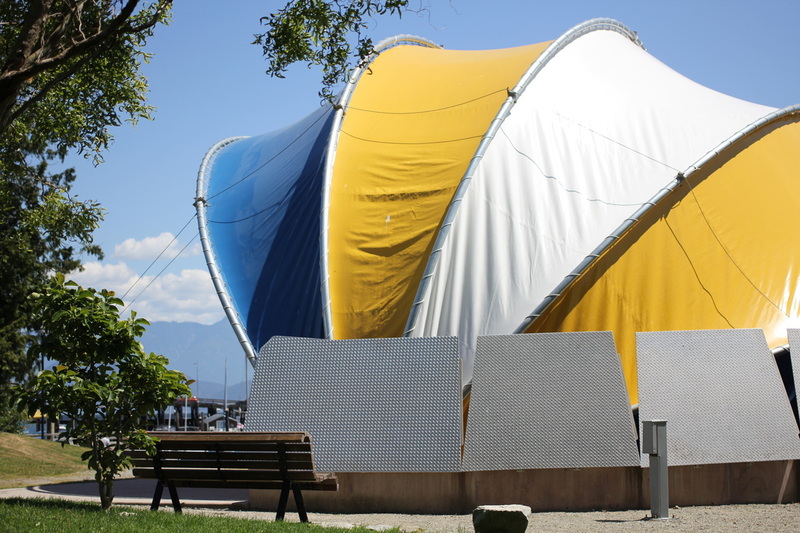 The temporary washrooms will be relocated to another Town of Golden park. 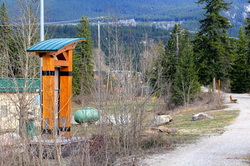 Adjacent to the Kicking Horse River, Mary's Motel, a municipal pumping station and Glacier Rafting, Centennial Park is an unkept greenspace near the Downtown. Kicking Horse Trail, 7th Street N border and a pedestrian trail border this highly visible spot as vehicle traffic steers around it. In the summer months, one may find rafters pulling out here. In the past, the Rotary Club has proposed a gazebo for this location. This gazebo could include a performance stage with the dike acting doubling as an amphitheater seating area. 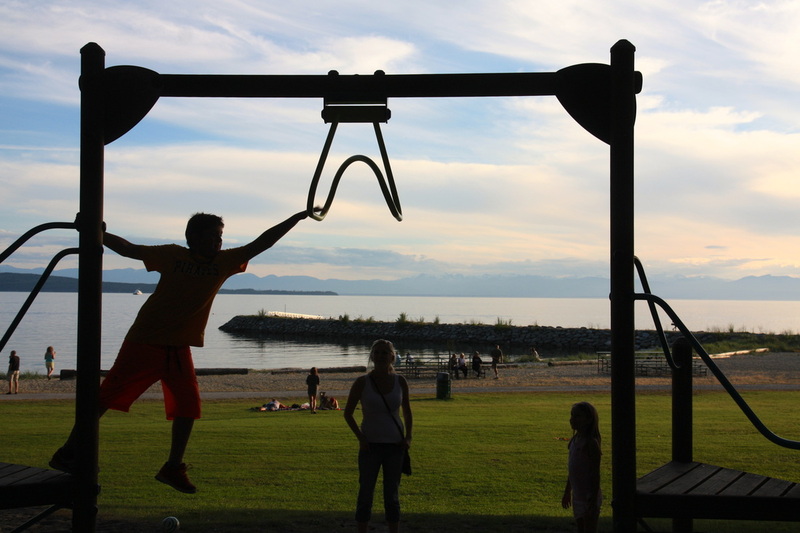 Play park, dog park or event space, this park has a lot of potential. 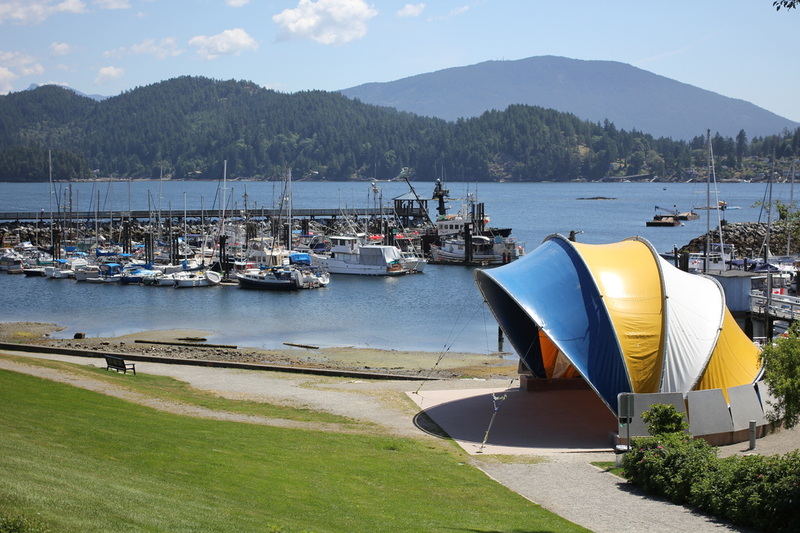 The Rotary Club of Gibsons, BC has developed a wonderful grass ampitheatre with a convertible band stand pictured below, which could inspire a similar project for Golden. 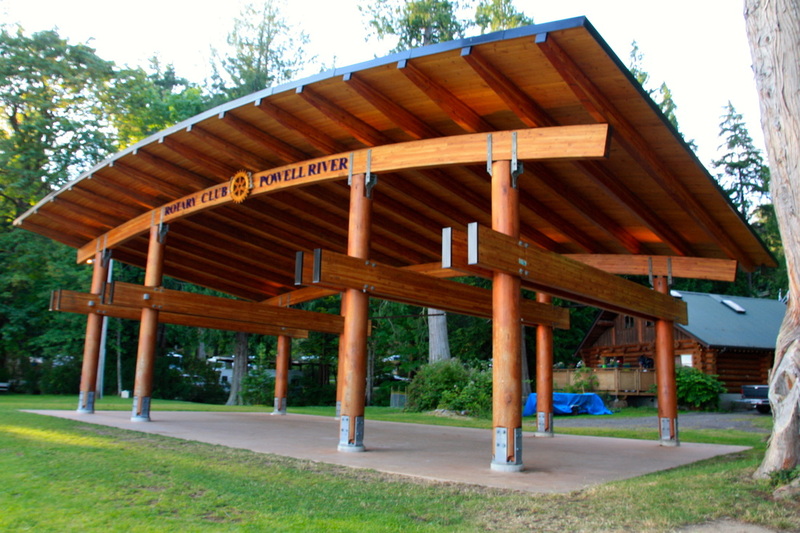 Powell River's Rotary Club went with a west coast design-inspired timber frame structure. 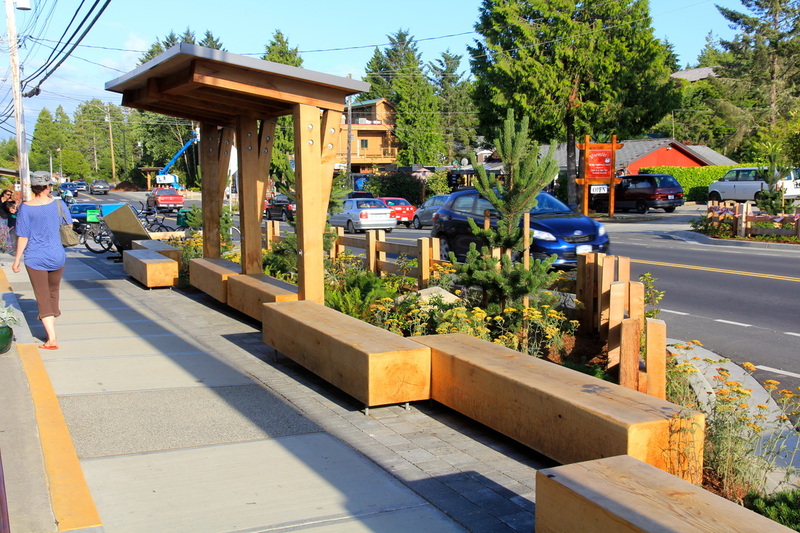 Benches, ledges, and seating encourage people to stay longer in a given area. 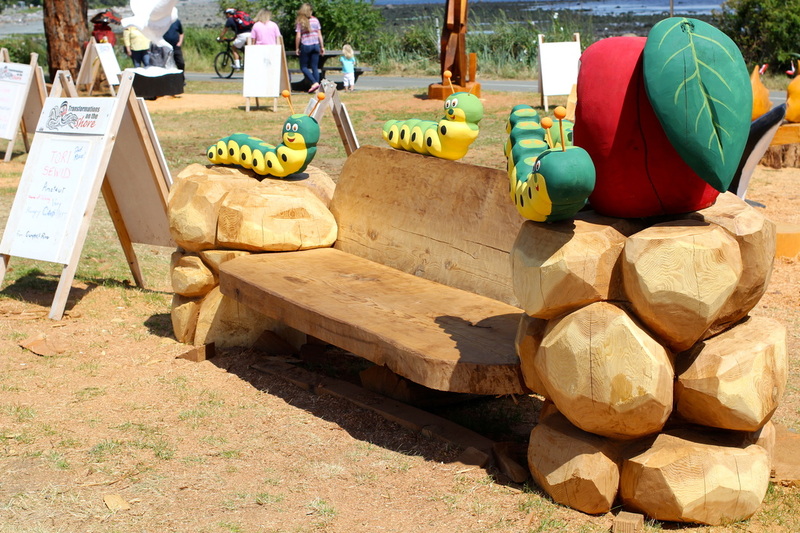 Seating can be made from concrete, local timber frame, simple logs or any number of other variations. 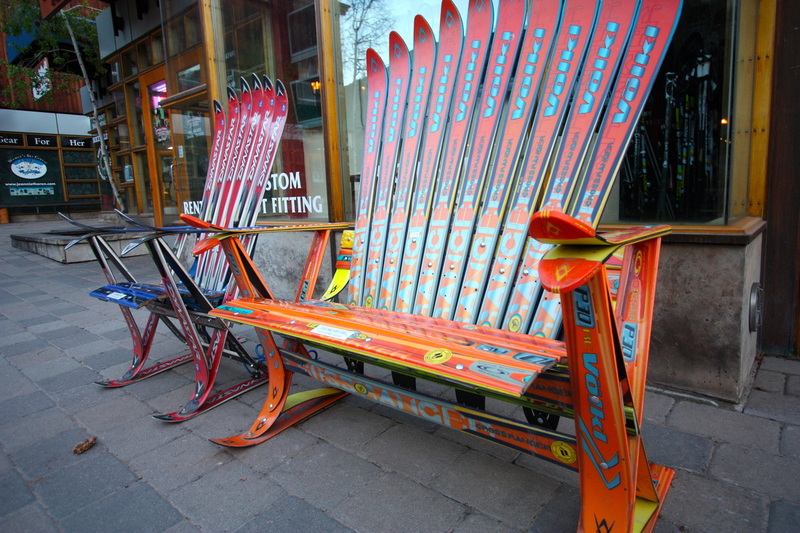 Some communities use a particular style of chair (Muskoka) as part of their identity. They could be passively taking in the scenery, people watching, enjoying a take-out or mobile vendor meal or playing a game. Without adequate places to sit in a downtown location, people will pass on to where there is - like their car, which will not encourage community economic development. Tourism activities do not have to involved million dollar projects. Sometimes the smallest tourism activities can be the most memorable, especially if they cross traditional generational boundaries. 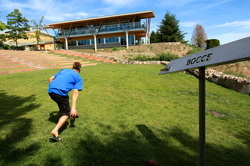 Life-size chess, bocce ball, over-sized Jenga and backgammon can be a novel experience for tourists or a way of building a sense of community with local residents. While some of these projects are best designed for a municipality to take on, many can be started by local businesses. Golden is a community of cyclists. 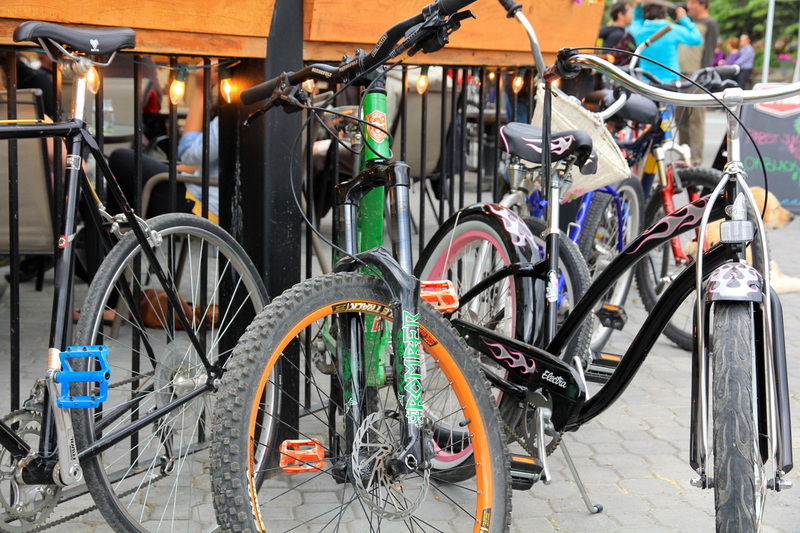 On a summery Saturday night in Golden, one might find more bikes than cars parked downtown. 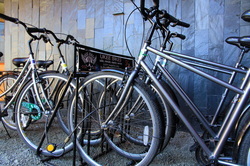 To prevent bikes from being leaned up against shop windows, basic bike racks were installed. Today, one can find more bike racks of varying shapes and sizes. Some bike racks are made to look like things - like a bike (Tofino) - while others have small advertisements built into them. Bike rack design and location needs to be integrated with bike paths, signage and crossings throughout the downtown and entire community. It is one thing to think your community is tourism-focused and it is another thing to make it easy for them to registered and buy tourism experiences while they are downtown. Currently, Kicking Horse Country's tourism product offerings are distributed across the entire region - from the Blaeberry and Kicking Horse Mountain Resort, to the BC Visitors Centre @ Golden and at individual offices in town. 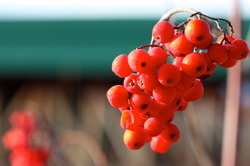 If you don't know what you are looking for, it is very difficult to find it. A central reservations office improves circulation in downtown area, bringing more shoppers and activity to downtown merchants. 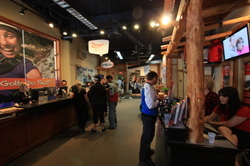 It also provides opportunities for every tourist to find an experience and not wait idly by while part of their traveling group goes rafting or mountain biking or snowmobiling. Currently most of the 30,000/year rafters pull-out at the Whitewater Amenities Hub 1km above the downtown or on Kicking Horse Trail 500m past it. In order to increase tourist traffic downtown, designated and safe pull-outs could be designed. Areas without jagged rocks, near an eddy or slow moving water near downtown would increase the likelihood that participants would get changed and go for a drink on a patio or shop downtown. However, for put-ins and pull-outs to work, there should be a clothes changing area, likely larger than the current public toilets in Spirit Square. 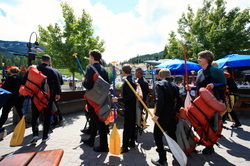 The photo on the left was taken at Whistler, BC where participants suit up in wetsuits and march through a patio and part of the village square before boarding a bus to their put-in site. There is no better advertising for rafting when the public sees this group leave and no better reason for a beer when this groups sees the patio on their way back. 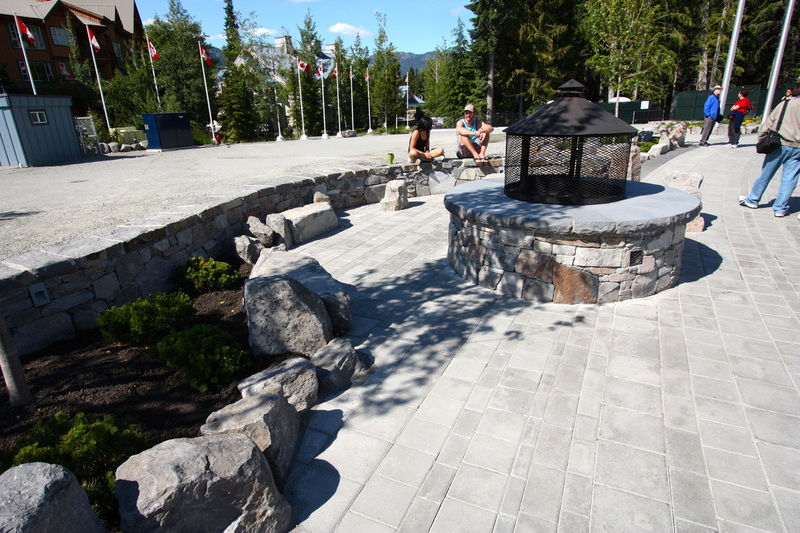 Spirit Square is the product of a provincial funding program and represents a lot of hard work and planning for the downtown core. 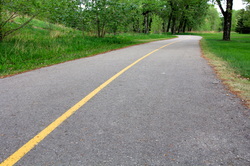 For it to be integrated into the culture of the community it must remain the beginning and completion of Golden's special events, like July 1st cycling or running races. The majority of the necessary infrastructure is there now, with public bathrooms, public viewing areas and occasionally farmers' market tables and tents, portable bleachers, stage or fire pit. Now more groups need to use this as their day-to-day and special event meeting place. To attract and grow events in Spirit Square, more will need to be done within it and in adjacent spaces. Anyone that has traveled in Europe knows the planning of successful community centres starts with access. And while railways and subways act as transportation hubs in those larger centres, North America's love of the automobile has either ignored this model or made it an after-thought. Unfortunately, rising energy and fuel costs (acutely felt in Golden), along with negative environmental and health impacts are resulting in a resurgence in public transportation and inter-modal transportation. A community may be able to anticipate this rising challenge by planning toward a transportation hub, where public transit, charter vans and buses, Greyhound and even delivery companies can be centralized from. 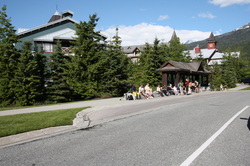 Transportation modes do not have to be restricted to road based vehicles and could include air (through the Golden Municipal Airport), helicopter (for the largest concentration of backcountry lodges in the world that surround Golden) and rail (as both the Rocky Mountaineer and Royal Canadian Pacific tours run through Golden, but rarely stop). 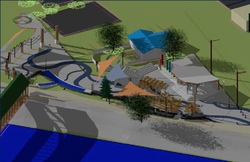 From the largest possibilities, like renewed passenger rail service, to the smallest steps, like re-instituting Kicking Horse Transit, the non-driving visitor and resident must be thought of and included in riverfront plans. Even bus shelters, community amenity maps, pedestrian over/under passes can provide some tangible evidence of forethought and help for the touring passenger, which may make it easier for them to find a coffee, souvenir, accommodation or new home. Resident green thumb, Duane Amundrud, has dreamed of engaging the entire community in a garden project which would beatify Golden and its Hospital grounds through the cultivation of native plant species. It was believed that this project would improve visual appeal to locals and visitors for decades; create an interest in nature and gardening for local children; and improve wildlife habitat and carbon sink, while decreasing water use. Substantial "in kind" participation was shown, but future development at the hospital may not make it the ideal location. 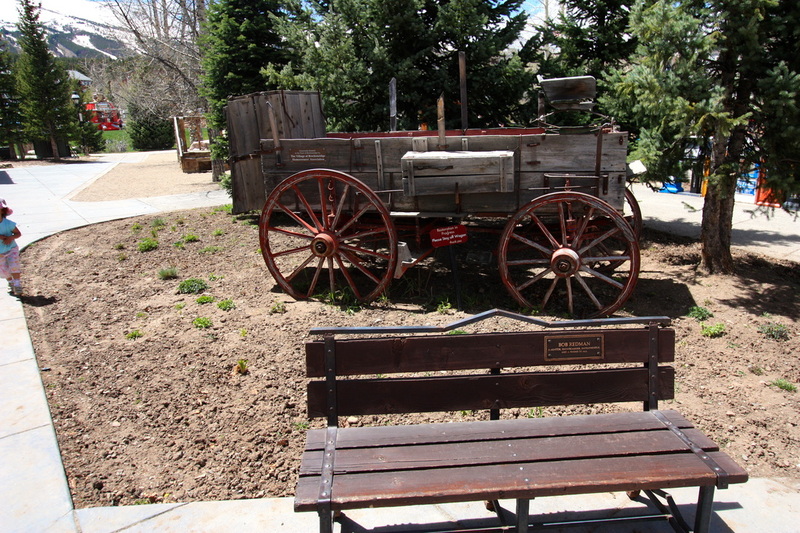 Luckily, there are many other areas in Golden that could benefit from this type of natural beautification project. Golden is not new to public art, at least in the paint medium. The Swiss Guides mural on the former 407 Boutique preceded the William Wenmen mural on the Kicking Horse Culture building. "The value of public art cannot be derived solely from an assessment of completed works, but must include its impact as a significant economic driver, its collaborative and complementary value as a component of public spaces, and its social value as a means through which to express, reflect and enjoy our city. Successful public art must be supported by a strategic management framework of maintenance and programming that creates awareness, promotes engagement, and ensures longevity through responsible stewardship." 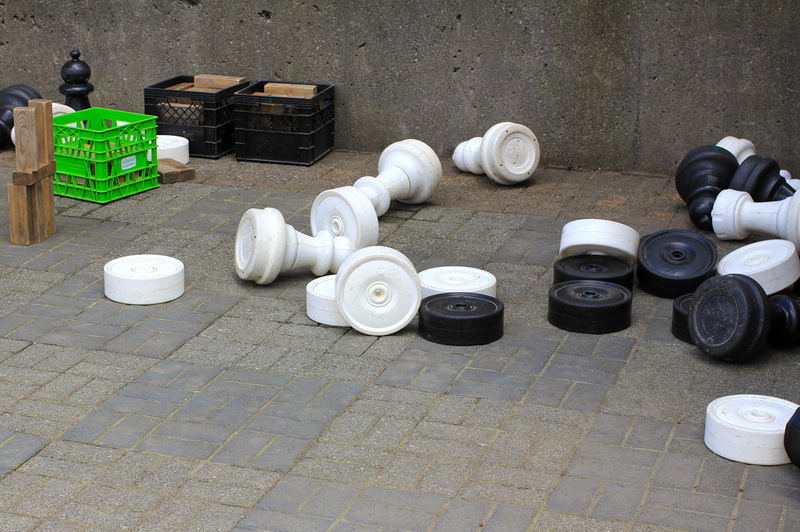 - City of Calgary's Corporate Public Art Policy 2004. 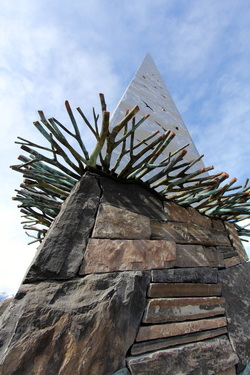 Public art policy and installations will help to communicate Golden's past, present and future. To accomplish this, the community can decide to use a certain percentage of total capital project costs for public art. 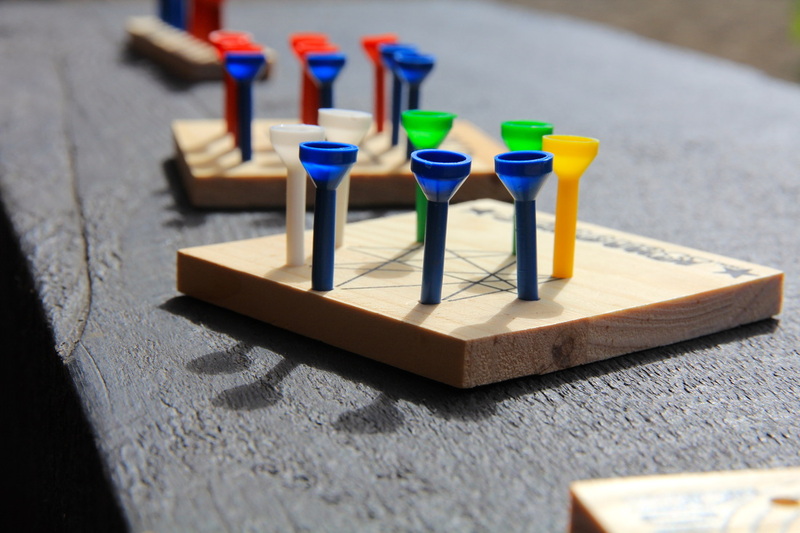 Once a management framework is in place, a public art board or committee can advise Council or its designate at arms length on policy for public art collection, public spaces and special projects. Although seen as a luxury by some, public art is one of the reason great culture spaces create such an attraction for locals and visitors alike (from Italy's great fountains to west coast native totems to Las Vegas' garish displays of commercialism). Collectively, public art can contribute to the quality of life and place, whether one passes it every day on their way to work or stumbles upon it just once while on vacation. For more information, please review the short Calgary Public Art Policy below or any of the tool kits available through Creative City Network of Canada. 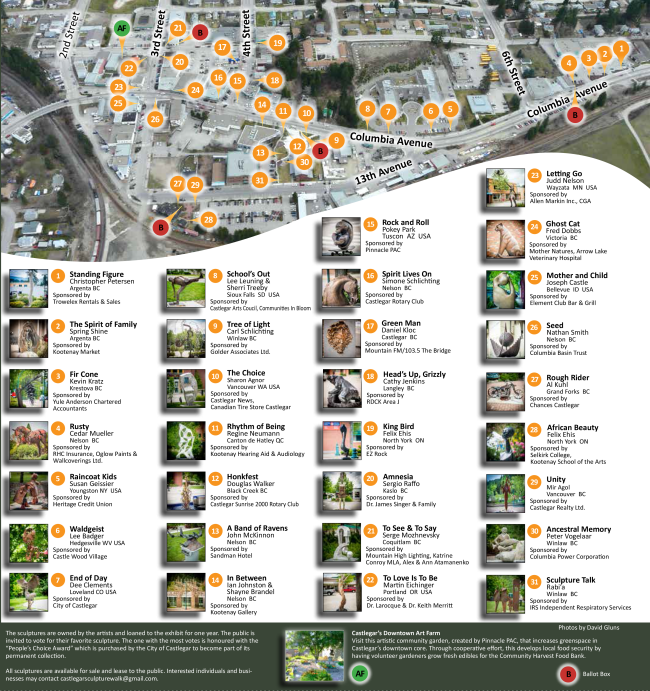 Photo below: The Castlegar Sculpture Walk is "a vital, vibrant downtown with different sculptures displayed every year." The map is shown below and the ballot form can be found on the right. Want to be inclusive? Want to enable people to get around the most efficient way possible? 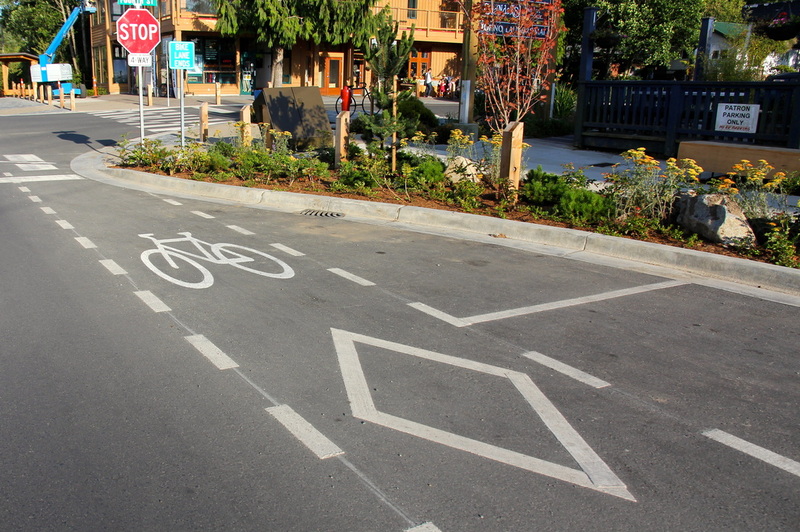 Then complete streets are worth thinking about. 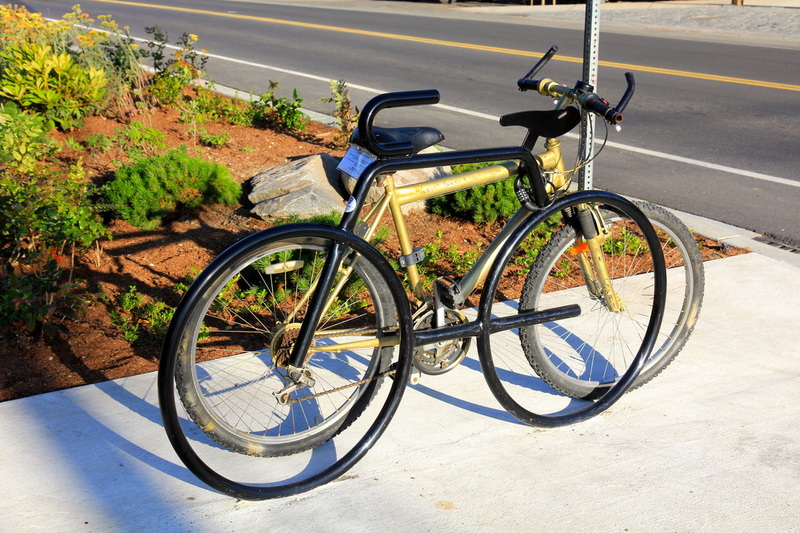 Golden is quickly becoming known as a bicycle community. 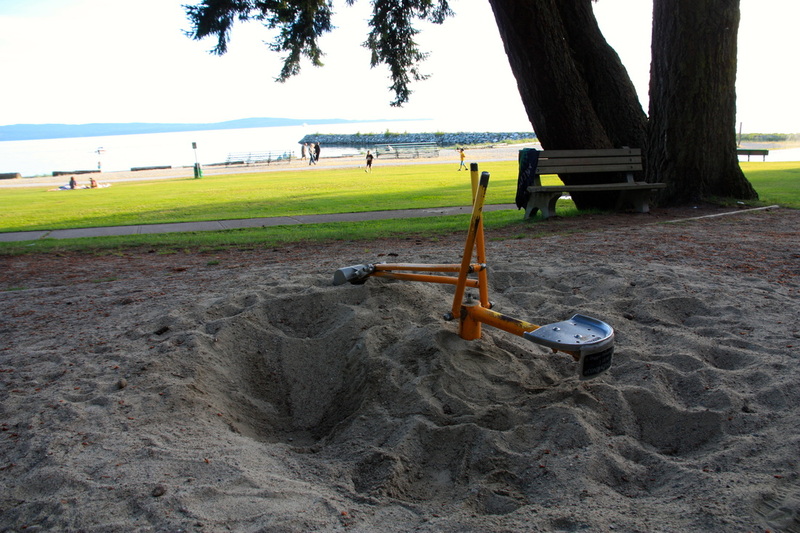 And not just by the young rock stars on Mount 7 or the Moonraker Trails, Over 41% of respondents to Golden's Age Friendly Community Planning survey (those 50+ years old) indicated that they use a bicycle to get around. With so many bikes on the roads and trails, it is important to keep them in good working order. The Town of Banff and the Town of Canmore have installed bike fix-it stations to help riders keep their tires pumped and everything rolling smoothly. While this is not a substitute for regular maintenance from a professional bike tech, these stations can keep residents and tourists moving until they get to one. One of these stations can run $1,000 and could be covered by Resort Municipality Infrastructure (RMI) funding, with support from tourism accommodators, the Town of Golden and tourism activity providers. With more people cycling, more space is freed up for tourist parking downtown.